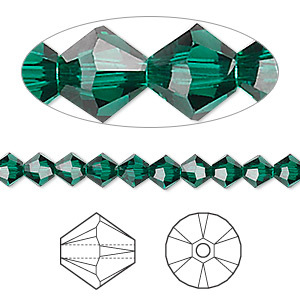 Bead, Swarovski® crystals, emerald, 5mm Xilion bicone (5328). Sold per pkg of 24. Item Number: H20-7635CY Have a question about this item? Design with Swarovski crystal 5mm faceted bicone beads for a little sparkle that goes a long way. Swarovski crystal components are made in Austria and are considered the finest products of their kind in the world. Bead, Swarovski® crystals, emerald, 5mm Xilion bicone (5328). Sold per pkg of 144 (1 gross). Bead, Swarovski® crystals, emerald, 5mm Xilion bicone (5328). Sold per pkg of 720 (5 gross).